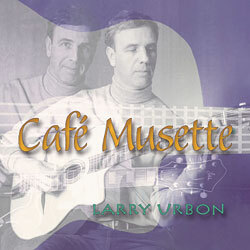 My friend Larry Urbon, a teacher in Connecticut, is a fine café guitar player of fingerstyle, seven string and Gypsy jazz. His CD, Café Musette, is an easy-going enjoyable collection of some of his favorites. All the parts were played by him and include bass, rhythm guitars (le pompe) and winning lead guitar. Such nice arrangements. My favorites are his version of “Nuages” and “Troublant Bolero,” two Django originals. Larry’s original, “Ma Vieille Chatte” is the first tune and is a pretty little thing. More info at the » Recent Recordings page.